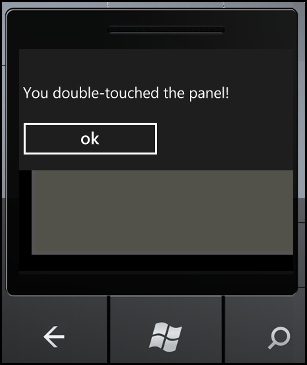 In my previous posting, I demonstrated how to register a touch (or tap) on Windows Phone. Today I will extend that to implement Double-Touch. To begin, I need to go back to the original Touch class and make two changes: the OnTouch method needs to be changed to protected (from private) and needs to be marked virtual so that I can override it in a derived class. Give your new class its own event (DoubleTouch) and a private nullable-DateTime object to hold the time of the initial touch. We’ll compare that time with the time of the second touch, and if it is within a second we’ll consider that to be a double-touch. The heart of this class is in the overridden OnTouch method which begins by calling the base method (to pick up the Touch) and then compares the time of the touch with the time of the first touch. If there is no time (the DateTime has no value) or if the time between touches exceeds one second then the time of the first touch is reset to the current time, otherwise the event is called. While you need not comment out the message box on the first touch, you do have to be quick to register the second touch in under a second. Commenting out the message box makes this easier. This entry was posted in Mini-Tutorial, Patterns & Skills, WindowsPhone and tagged Mini-Tutorial, WindowsPhone. Bookmark the permalink.